All You Need To Know About Northern Chile. When I think of Northern Chile I think of lots and lots of sun, deserts, white sand beaches, salt flats, clear skies for star gazing, geysers and beautiful scenery's. Northern Chile starts up at the border of Peru and it finishes at the Copiapó river. This includes the Far North (Norte Grande) and the Near North (Norte Chico). The Far North starts at the Peruvian border and ends about 27° south latitude. This includes the 15th region, called Arica y Parinacota,the first region called Tarapaca, the second called Antofagasta and half of the the 3rd region called Atacama. The temperatures in this area at sea level range from 20.5°C in the the summer and during the winter 14°C. This is where most of the population live (in the coast), in less extreme temperatures due to the humidity. This part of Chile contains the Atacama Desert, one of the driest deserts in the world, in fact in some parts of this desert it doesn't rain at all. This is an arid plateau that gradually descends from the Andes mountains into the coast, then all of a sudden it breaks down abruptly. The topography found here creates microclimates in the coastal area capturing any clouds and fog that is generated from the cold ocean water. The fog, witch they call Camanchaca allows some vegetation to grow in this area. This part of Chile contains the Atacama Desert, one of the driest deserts in the world, in fact in some parts of this desert it doesn't rain at all. This is an arid plateau that gradually descends from the Andes mountains into the coast, then all of a sudden it breaks down abruptly. The topography found here creates microclimates in the coastal area capturing any clouds and fog that is generated from the cold ocean water. The fog, which they call Camanchaca allows some vegetation to grow in this area. 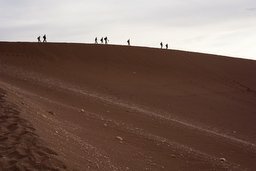 Once you pass the coastal bluffs you find the driest part of the desert, which is surrounded by a hilly area and is next to the Andes Mountains. This is the area where it never rains and there isn't any vegetation except for places where there´s some kind of irrigation due to the melting of the snow. Parallel to the Andes mountain you find some mountains ranges and some salt flats. 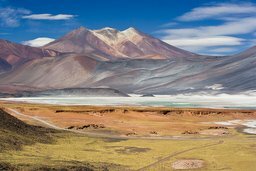 The main mountain range is the Domeyko Chain (Cordillera Domeyko) and the most popular salt flat is the Atacama Salt Flat (Salar de Atacama). In some sections of the desert, mostly the edges, there some development of forest mainly of tamarugos, spiny trees that are native to the area. These are found mostly in the Tarapacá region and grow in salty grounds. 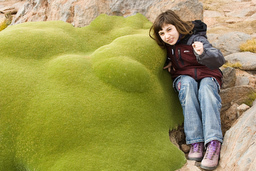 Another common vegetation of the area is the Llareta, which is a light green colored bush. In the colonial times most of the vegetation were cut down to fuel the fire use to exploit the mineral deposits. This resulted in the creation of even drier surface conditions. 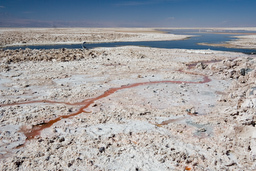 In the northern parts, past Atacama, water tickles down from the Andes and form narrow rivers. These rivers influences the development of valleys covered with vegetation, such as tropical fruit and vegetables, that grow all year around. This can be seen in the Azapa Valley, which is known for it´s purple colored and bitter tasting olives. These valleys contrasts with the bone dry hills and are called Quebradas. The Quebradas separate extensive plains called Pampas, the main pampa is called the Pampa del Tamaral. The eastern parts are at higher altitudes, they range around 11,000 and 12,000 Ft, and are close to the Andes. They include a lake district and is known as a continuation of the great Altiplano and is called the Puna de Atacama. Through this part crosses a line of volcanoes from north to south, this forms an extensive lava beds that covers most of the surface. The main volcanoes are the Licancabur, Acamarachi, Láscar, Miñiques, Pular, Socompa and the Llullaillaco. Another characteristic feature of this area are the saline lakes formed by the rainfall that is received in the summer months, called the Bolivian Winter. 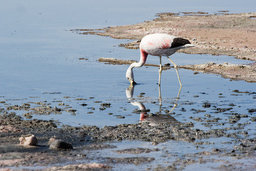 These shallow saline lakes are the home of a number of bird species including the beautiful pink flamingo. Northern Chile is one of the main income resources because of it´s mineral mines, mostly copper. There are two famous copper mines which supplies the world with copper. The Chuquicamata mine and the Escodida mine. The first is the world´s largest open-pit cooper mine and the second has the largest production in the world. It starts at the southern border of the Atacama Desert and ends with the Central Area at 32° south latitude, border which is in the 5th region of Valparaiso, just north of Santiago. This includes the other half of the 3rd region called Atacama, and ends with the 4th region of Coquimbo. This is a semiarid area that receives about 25 mm of rain in the central area during the four months of winter, although it is subject to droughts. The temperatures are more moderate than the far north, and are around 18.5°C in the summer and 12°C in the winter at sea level Just like in the far north, there is a microclimate in the coastal area too. In these areas the moister from the water is captured by the bluffs that ovelook the ocean, creating template rainforest's in these parts. One example of this is the Fray Jorge National Park (Parque Nacional Fray Jorge).The winter rains and the melting snow from the Andes mountains produce rivers which carry water all year round. The river valleys provide breaks in the costal heights allowing marine moister to penetrate inland and help diminish the arid climate in the valleys. The higher areas are covered by cacti and shrubs of different kinds. The near north is a very mountainous area, this is the home of the first (Ojos de Salado), second (Nevado Tres Cruses) and forth (Nevado de Incahuasi) highest mountains in Chile. The mountains form elongated spurs that cross the country from the Andes to the coast creating transverse valleys that are very fertile and beautiful. 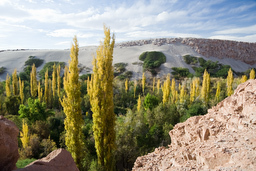 The most famous valley is called Elqui Valley (Valle del Elqui). These valleys have perfect conditions for cattle raising and growing vegetation like pisco grapes, for Chile´s national drink called pisco. This is the best place in the world where you´ll find the clearest skies in the world for star gazing. That´s why there are so many observatories here such as, the Cerro Tololo Inter-American Observatory and the Silla of Paranal Observatory, to name a few.